Sometimes a company pulls out all the stops and does something good for a change. Sometimes a company does the opposite of what Clark Howard calls "customer no-service". I was fully prepared to write about how Frontier rested on their laurels and lost another customer. Instead, I was amazed. Back in '99 DSL was THE thing to get if you wanted fast internet speeds so when we bought our first house I took the plunge and hooked up 1.5 Mbps down, 384K upload speed. That was 12 years ago and our speed hasn't changed since. At that speed today's internet seems like a 56K-dial-up-modem crawl. YouTube and Netflix videos take FOREVER to load and buffer frequently. In 2005 cities near me were some of the first to roll out Verizon FIOS with synchronous speeds up to 15 Mbps. In 2007 Verizon came to a city council meeting in my town, talked up their new service, and applied for a cable TV franchise license. How did I feel about this? Ecstatic would be an understatement. I signed up to be notified when FIOS would be available in my service area. And then the waiting game started. I checked the Verizon website every 6 months or so to see if their FIOS announcement had been made. And then I signed up to be notified when Verizon FIOS would be available in my service area. And then in 2009 Verizon sold off their "rural telephony business" to Frontier Communications. More waiting... And then I signed up to be notified when Frontier FIOS would be available in my service area. Several times I went on the Frontier support site and submitted a support request to ask when I could upgrade my service. Each time they told me that there was nothing they could share with me. Did I mention that I signed up to be notified when FIOS would be available in my service area? In the mean time my wife's parents have a Comcast TV/internet bundle. Every time we visit I love seeing my download speeds go to 14-16 Mbps. Why didn't I make the jump? I don't exactly enjoy bandwidth caps, speed inconsistencies, blocked ports, and other weirdness that comes along with Comcast's network. So I soldiered on. Speeds at work are FABULOUS. 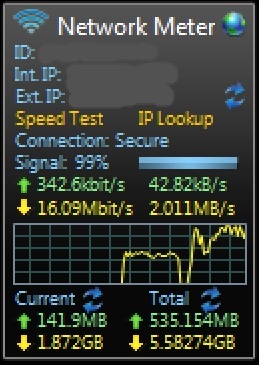 I can download files from 3rd parties at speeds approaching 100 Mbps (with some limitations, of course). So when I get home and slow down to 1.5 Mbps it feels like walking back in time 12 years. I have been a Verizon/Frontier customer in Sammamish, WA, for over 10 years with both phone and internet service. While my DSL service is quite stable for many years (no service interruptions!) the speed just doesn’t cut it anymore. I have had the same DSL speed for 15 years and I need something faster. I have the 1.5 Mbps download, 384K upload DSL, which is the fastest available due to my distance from the CO. I would love to be able to get something faster, perhaps 10x faster, and I’m willing to pay for it. When will Frontier build out FIOS service in the Sammamish, WA, area? I am interested only in phone and internet, not TV service. I like the pricing and bundles available on your website but have been waiting for a LONG time. I’m not sure I can wait much longer. I expected a response within a week and to be sent back and forth to sales and support and, in the end, nothing really happening. Boy, was I wrong. Thank you for reaching out to me regarding your Frontier services and I appreciate the opportunity to serve you. Frontier Washington has a very aggressive plan to enhance the high speed internet experience over the next six months. Rich Klena is the Washington State VP, and Jason Gamble is the local General Manager. They will reach out to you to share more specifically the plans to enhance your neighborhood. Appreciate your business for the last 10 years and I want you as a customer for life! Jason G. is out of the office today. He will be in contact with you tomorrow morning. Four hours later I got an email from Tim B., a Frontier Technical Supervisor located not far from my home. I am a Frontier Technical Supervisor located in Kirkland. My understanding is that you would like to upgrade your internet speed with Frontier. I would like to investigate what options we may have available to you. Can you please provide me with your billing telephone #, address, and a contact # where I can reach you? After a couple of emails back and forth with various technical folks they informed me that my best option was for 7M download, 768K upload bundle package. The message included the best news I've heard all year: "By rebundling your service, you will be saving money over your current plan." Let me get this straight: If I renew my 2 year contract (which is only 6 months old to begin with) I get DSL speeds 4.7 times faster than my current line and it will end up costing me less per month? Where do I sign up? I can now stream Youtube videos at 1080p, where before it was stuttering on 480p. I can now watch a Netflix video on my XBox while someone is downloading their email in the other room (couldn't do it before). Remote access to my work computers is MUCH faster. So there you have it: a great example of how a big company listened to a customer and did the right thing to improve their experience with their product. The entire process took less than 2 weeks. Now I only wish I had done this a couple of years ago. Copyright © 2012, Lee Donnahoo. All rights reserved. Photography copyright the author unless noted. Awesome Inc. theme. Powered by Blogger.